The Fremont Rose Vacation Rental Home Lake of the Ozarks Missouri Property Managed by Crystal Water Villas, Inc. The Fremont Rose Home is an amazing 2 story family oriented property with vaulted ceilings, stunningly quiet cove with expansive channel lake views. Decorated in a very comfortable fashion this home boasts 4 spacious bedrooms, 2.5 baths, an oversized living space, fireplace, flat screen TVs, Internet, WIFI, an up to date kitchen with granite counter tops and newer appliances, three two multi-level open (sunny and shaded) decks, two covered lake front patios, a large private dock with an open boat slip and an amazing manicured lake front yard with over .3 acres. Upon entering the house you are immediately taken back by the picturesque vaulted ceiling lake views that this vacation rental home has to offer. Within a few steps from the entry you're in the large vaulted space that contains a spacious Living Room with plenty of seating for the entire family. You'll enjoy the wood burning fireplace, flat screen TV with cable/Blue Ray/Internet/WIFI access, plus the Living Room does have a twin size sofa sleeper. Just to the right of the entry is the spacious Master Suite with a queen size bed, flat screen TV/Blue Ray, full size bath with double vanity sinks and walk in shower, with direct slider door access outside to the upper level deck. Also off the home's entry is the very conveniently located guest 1/2 bath and laundry room. Step up from the Living Room into the expansive open floor plan Dining Area and Kitchen. There are two great dining tables that flank the Kitchen and comfortably seats 10. The Kitchen is a lake cook's dream with its open floor plan and great views of the lake and even a breakfast bar for 4. The granite counter tops are gorgeous and the kitchen is furnished with all the necessary appliances. This private home is set up to enjoy every aspect of your lake experience. Downstairs (just off the home's entry) is the hallway that accesses the three great guest bedrooms, another full bath with a shower/tub combo and a small utility room. Just off the downstairs stairway are two large lakefront bedrooms. Each bedroom has a queen size bed with additional seating, flat screen TV's/Blue Ray and atrium door access to the lower covered patios. The fourth bedroom (also downstairs in the Fremont Rose) is set up as the kid's room with a twin over twin bunk bed and full size bed with flat screen TV/Blue Ray. If you're not on the water, you'll be watching movies, playing board games, cards or perhaps enjoying a little outdoor competition of corn hole toss. This 2,160 square foot property is perfectly situated on a gentle lot with easy outside access to everything. Just off the upstairs Living Room and Dining Room slider doors is a huge outdoor deck with newly installed composite decking with a patio dining set for 6 and great gas grill and perfect for cozy nights watching the stars or cool morning coffee for two with chairs by the Master. And there is a lounge chair on the "sunny" part of the deck. Down the deck stairs are two covered patio areas with a pub set. Just beyond the patio and landscaped garden is the expansive grassy lakefront yard with sunny areas tall shade trees with added outdoor amenities like corn hole bag toss, a large hammock, and an outside fire pit. Walk down the landscaped sidewalk from the parking area or covered patio, past the manicured yard to the shoreline's large concrete dock with an open slip for your boat/PWC (rents for $10 per day and the boat slip is huge - 14'x36' and large lakeside swim platform. Add dining on the deck to your list with a patio set that seats 4, along with two deck chairs for watching the sunsets, or taking out the SUP board that guests can use. The water is calm in the very desirable protected cove and yet you'll be amazed at the boat traffic that passes by in the distance along the Gravois Arm. The yard in the Spring-Fall is gorgeous and the view from the decks or covered patio is spectacular - day or night! This private home is stocked with all bedding, bath towels, dish towels, iron, and ironing board. Other features include weekly trash pick-up and parking in the driveway for at least 2-3 cars and covered carport for 1 additional car. The Fremont Rose Home is just 25-30 minutes away from all the action on the busy side of the Lake – Bagnell Dam, Lake Ozarks, and Osage Beach – via the community bridge. Also, the property is just 5 minutes from the Buck Creek convenience store and 10 minutes away from the town of Laurie , several local restaurants, a public golf course, cinema theater and bowling center. And if you're on the water, you are less than a 10 minute boat ride from two of the hottest lakeside restaurant destination - Coconuts, Jolly Rogers & H. Toads Complex. Boat on to the main channel and you are within 10-20 minutes to other lakeside dining destinations or even Bagnell Dam. The Fremont Rose is also near the Tap & Grill Lake Side Brew Haus - about 2.5 miles by car and about a 5 minute boat drive. Also H. Toads which is open 24/7 for gas year round. Do plan to take in any number of the Lake's attractions including state parks, theme parks, cave explorations, go-karts, bowling, music shows, museums, and of course lots of shopping. We can help with any of the details of your vacation planning and would be glad to mail out vacation guides, restaurant guides, state park guides, etc. Our hospitality is yours for the asking! All properties are furnished for normal housekeeping with dishes, cookware, flatware, glasses, grills, and basic appliances. Sofa sleepers are recommended for children’s use only and not that of adult usage. We are also pleased to provide bed linens, bath towels, and a starter packet of detergents, bath soaps, trash bags and paper products (toilet paper and paper towels). Please bring replacements for starter packet items, your own beach towels, soaps, personal toiletries, coolers, cleaning supplies, cameras, life jackets, etc. Amenities: Central Heat & A/C, Flat Screen TV/Blue Ray in All Bedrooms, Lakefront, Private Boat Dock & Boat Slip. Rates are based on an 12 person occupancy. FAMILIES ONLY. No Additional Guests Permitted. Full Week Stays Already Discounted 20%! Sorry, No early arrivals or late departures for this property. Boat Slip rents for $10 per day (14x36). Mandatory Departure Cleaning Fee $185. Mandatory Security Deposit Insurance Policy - $49 (default) or a refundable damage deposit - $3000. Non-Smoking Home, No Pets and Shoes Off When Inside the Home. The property really felt like staying at home. Clean, comfortable beds, all the dishes you need and tons of space! 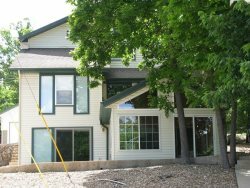 If you’re coming to enjoy the lake and quiet, this is a great secluded property to enjoy. Great place and location. Hope to come back soon! We couldn't have asked for more! We fit three families in this property, with all of the kids sharing the fourth bedroom (bunk beds and a queen bed). Tons of amenities. We thoroughly enjoyed being able to walk right to the backyard to fish and swim and boat! I would recommend this house to anyone! I found Sherry at Crystal Water Villas great to work with. She responds quickly to inquiries and is very helpful.